Millennials are doing lots of good work with our savings. We're saving earlier than our parents did. We're saving more too. All that despite making around 20% less than our parents did at the same age. But there's one thing many of us are doing wrong: We're investing in the wrong things. 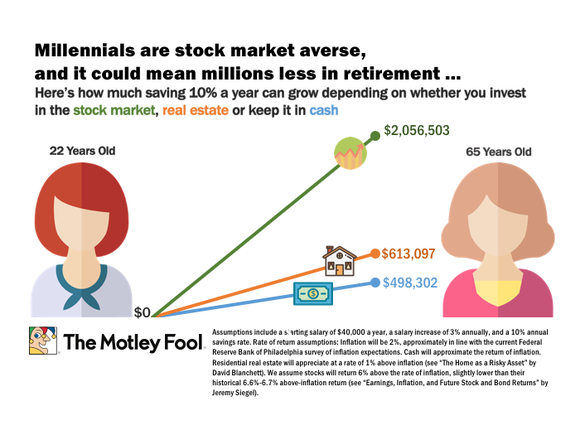 According to a recent survey by Bankrate, young adults favor cash (30%) and real estate (30%) over stocks (13%) as their preferred investment vehicle. Investing in cash or real estate is a terrible idea. Here's why. My generation came of age during the Great Recession. So it's understandable that many fear the risks of the stock market. 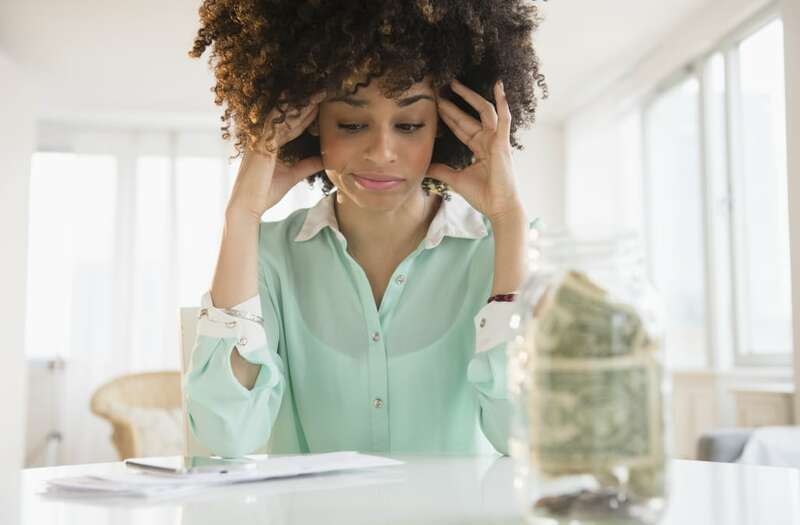 Investments gain and lose value on a daily basis, and too many of us remember watching our parents' hard-earned retirement savings slip away during the depths of the stock market collapse in 2008. By contrast, cash provides certainty: It won't disappear overnight. And real estate investing is backed by big, tangible assets – physical properties – that seem more durable than an online brokerage account. Historically speaking, both cash and real estate also provide another certainty – the certainty of lower returns than the stock market. The problem with cash is that your ability to buy things with that cash – your purchasing power – does no better than keeping up with inflation. Even if a dollar today earns 1%-2% interest in a savings account – virtually unheard-of these days – it's still doing no better than keeping pace with price increases. Real estate, by contrast, has historically outperformed inflation. By a whopping 1% annually. Contrast that with the stock market – through all their hills and valleys, stocks have historically returned inflation + 6.6% annually. So on the one hand you have the risk that your investments will decline precipitously on some years – versus the certainty that your purchasing power won't significantly outpace inflation (and could even lose to it). With that in mind, let's reframe risk here: If the true risk that you're looking to control for is the risk of not having enough, then I would submit that cash and real estate are far riskier than stocks. Put a different way, you're much more likely not to have enough over a long period of time with real estate or cash instead of stocks. Taken as a whole, over a long time span, the stock market is a much surer ticket to long-term wealth than cash or real estate. Now, to be clear, that isn't to say that you should never buy a house or never keep cash around. We at The Motley Fool believe strongly in having a big emergency fund -- most folks recommend six months of expenses or so in cash for a rainy day – and I'm personally planning to buy a house later this year. But putting your retirement savings into those investing vehicles is much less likely to give you the returns you need for your golden years. When you're building a budget, the first thing to look at is non-essentials you can cut. Music, movies, books, apps and other bits of entertainment often fall into that category. However, you might not want to give them up. The good news is that you don't have to. You can get all of these things for free if you know where to look. Learn how to get these for free, and more tech purchases you might be making that you don't have to. When online shopping first started, it was a bonanza for saving money. Online stores didn't have to deal with sales tax, a large chunk of typical retail overhead and you could usually find a free shipping offer somewhere. In recent years, however, brick-and-mortar retailers have evened the odds with price matching and other savings. So you still want to check both for deals before you buy something. However, there are three things you might buy that are almost always going to be less expensive online. Find out what they are and some good sites to find great deals. When you're trying to cut non-essentials, your cable bill probably doesn't spring immediately to mind. Even though it's a huge expense every month, many people can't imagine going without their favorite shows. Just because you're keeping cable, though, doesn't mean you should keep paying full price. Learn three secrets you can use to save big money on your cable bill, plus some cheaper cable alternatives you should consider. Your Internet connection lets you check Facebook, send email, browse the Internet, watch online video, play online games and connects you to the single largest source of information in history. You need it to be fast, and you probably pay a hefty amount to get an Internet plan with decent speed. But are you actually getting the speed you paid for? If you aren't, then you're just wasting money every month. Find out how fast your connection really is so you know your money is well spent. One of the biggest travel expenses is the airfare. Even worse, every dollar you're spending on getting to and from your destination is money you can't spend enjoying yourself while you're there. So, finding a cheap flight is definitely something to shoot for. Fortunately, getting a great deal is easier than you think. You just need to know what sites to use, when to buy and the value of flexibility. Get the full details so you can save big on your next trip. Choosing stocks is worth an extra $1.4 million in savings compared to real estate, and over $1.5 million compared to cash. In fact, in some cases, this is understating what investors can achieve. Because these are average returns – meaning that stock market investors who perform above the average can do even better. Frankly, outperforming the market isn't easy. It requires dedication, time, and lots of research. If that doesn't sound like you, chances are good that your best move is to just invest in a few index funds (Vanguard has some of the best) and keep on with your life. But for those interested in going a step further, The Motley Fool has a great resource. It's called The Motley Fool Investment Guide – and our team just released the third edition, complete with updates, fresh examples, and a new chapter on options investing. I personally believe that it should be required reading for any new investor. And even for more experienced folks, it has plenty of useful information that can help you better hone your investing process. The Motley Fool Investment Guide isn't just for individual stock pickers and options investors either – there's lots of good information about thinking through mutual and index funds (which are how 401(k)s are usually invested) and how to pick the right ones. Order it here, and learn to invest better today.